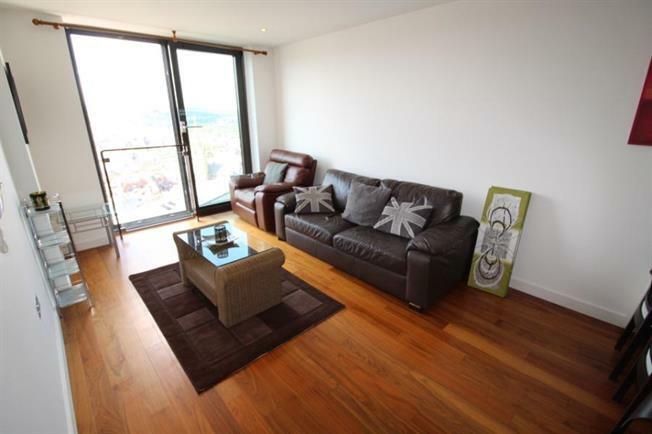 2 Bedroom Flat For Sale in Sheffield for £200,000. We're delighted to offer for sale this stunning two bedroom apartment, located on the 21st floor of the landmark development, City Lofts. The property on offer is a must see to appreciate the exceptional, panoramic views looking over Sheffield City Centre. The apartment on offer features a lovely, bright and airy lounge with clearly defined kitchen space. The kitchen offers ample base and wall units, with a grey finish. You'll find integrated appliances including; electric cooker and fridge / freezer. Both of the bedrooms are spacious doubles, with an en-suite shower room provided to the master bedroom. Both the bathroom and en-suite are fully tiled, three piece suites with a contemporary style. If you're looking for City Living, the location couldn't be better. City Lofts is located in St. Pauls Square, you'll find a host of shops, bars, restaurants and many other amenities close at hand. What's more, you'll be within very close walking distance to the Hallam University and Sheffield Train Station. The apartment on offer is currently tenanted until August this year, with a monthly rental income of 1,100. Furniture is also open to negotiation. Please contact branch for further details.